Who is in your tribe? I know I’ve been thinking about that this past week and considering who I want to travel with in this literary life. 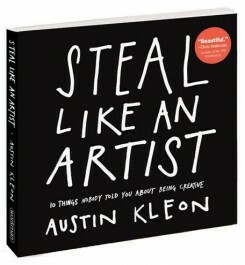 This week I read (and highly recommend to you) Austin Kleon‘s book, Steal Like an Artist (Workman Publishing, 2012). It’s a fast read, a little book with lots of fun visuals that packs an important punch when it comes to our discussion of literary citizenship. One of his points is that there’s nothing new under the sun, so all of us are really getting our ideas from other people–“stealing” them as it were. “The artist is a collector. Not a hoarder, mind you, there’s a difference: Hoarders collect indiscriminately, artists collect selectively. They only collect the things that they really love. . . . Your job is to collect good ideas” (13-14). Where do you collect good ideas? Your tribe and the conversations you have and the books you share and the literary magazines you read and the bloggers you follow–those are places to start. And Austin Kleon advises that you look to history as well. What classic books do you absolutely love? Which ones are on your shelves because . . . well, just because they do something for you? They speak in a way that no one speaks anymore. Find that one author and study everything you can about him or her–lifestyle, writing habits, opinions about writing and publishing, and of course, writing style. Then find others who had an influence on that writer and study them. Build your own “creative lineage,” as Kleon calls it. Add them to your tribe. They won’t mind. In fact, as Kleon notes, you can apprentice with them totally for free. “They left their lesson plans in their work” (17). Then, what current writers are doing it for you? Who would you be a groupie for if authors had groupies? Who would you wait in line to meet? Who is writing in a way that causes you to just sit back and say, “Wow”? What literary magazines do you subscribe to? Whose blogs do you follow? What online journals do you consistently read? Whose writing amazes you? As citizens of the literary world, we should be studying and learning from those writers who inspire us. Be inspired. And chances are, you’re inspiring someone else, though you may not even realize it. Discover the people who do it for you. Share their books. Talk about them. Buy them. Give them away. Blog about them. Just tryin’ to practice what I preach. As a writer, I “borrow” from Nicholson Baker. My magazine does the same with PANK Magazine and Atticus Review. When I paint, I think Edvard Munch. I’ve spent most of my career as a musician and have borrowed from thousands. Good tip on collecting instead of hoarding. Sounds like a book I should check out. Thanks for posting. Thanks for reading! I’ll check out your magazine!